Beyond the issues stemming from the new academic expectations of a US university, international students experience the ever-existing issues associated with transitional adjustments and with differing expectations from a new cultural environment. In fact, cross-cultural differences translate very directly into how international students tend to approach the US job market and in the way they self-promote themselves. International students are often not used to promoting themselves to an employer, which may affect them during an interview process or an internship. Self-advocacy is to take actions to speak up for yourself, communicate your needs and concerns honestly, and seek support and guidance to advance your growth. It requires you to know yourself and convey the information to an appropriate person. The key is to do it with confidence and comfort, and with respect and consideration of the other person’s priorities. 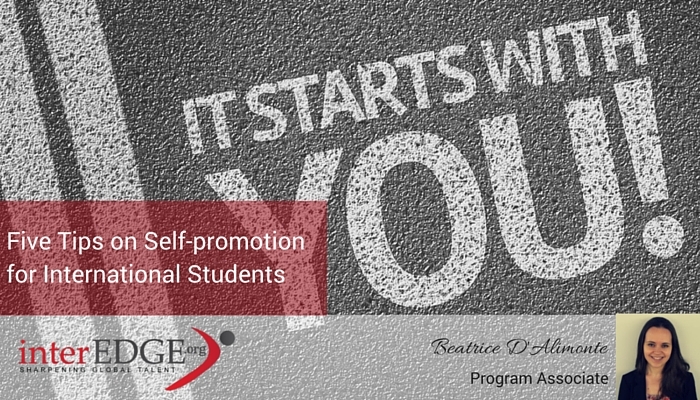 Here are five quick tips on how you, as an international student, may want to promote yourself in the workplace. Tip #1: Shift your perception of self-promotion. You may find that the idea of self-promotion continues to make you feel uncomfortable. Understanding the individualistic nature of American culture may help shift your perception of promoting yourself. In many collectivist cultures, self-promotion may be perceived as arrogant, a negative personal trait. In individualist cultures such as the US, individual identity is firmly recognized and respected, as it is expected that you will speak for yourself, your needs and priorities. With this in mind, you may be required to challenge your perception of self-promotion, and consider it more as an opportunity to articulate your most valuable skills for surviving in the US job market. Tip #2: Learn how to share your professional experiences. Once you begin to consider the concept of discussing your skills as an exercise of self-expression for your professional success, you need to master the balance between self-promotion and bragging about your worth. Although you want to highlight your global strengths, you should do this with modesty, focusing more on the skills and lessons you have learned throughout your professional experiences rather than excessively promoting your skills. With this strategy, you will shift the focus from you as an individual to your skills and talent while leaving opportunities for open communication with your colleagues and managers. You may experience not feeling adequate for a particular position due to lack of self-confidence in your language skills. How to step out of it and talk about your achievements? You may find it helpful to pretend that you’re describing someone else’s. This strategy will help you to reflect on your achievements from an outsider perspective and be more objective about your deliverables, workstyle and global insights (often considered a great added value). Tip #4: Commit to working hard and do more than your job description. Always go above and beyond your job description and seek around for opportunities. Those that get noticed at work are the ones who approach each day with a bigger vision. When you are asked to do something, see it as an opportunity to be noticed. If you’ve got a particular skill or talent that you want to promote around the office, make it available to others. For example, if you’re good at PowerPoint, and you know someone who needs to give a presentation, offer to look at their slides and give feedback. The more people feel supported by you; the more likely they are to give you the support you need when you ask. This technique is useful because it wins good working relationships and demonstrates your value to your boss. International students who may not know how to master that skill yet, they may want to focus on optimizing their output and performance in the workplace, and place faith in their manager’s ability to recognize these efforts. Tip #5: Practice, practice, and practice! You may have experienced feeling tongue-tied while facing a perfect opportunity to self-promote. Those opportunities are rarely announced beforehand and leaves no time for preparation. It means you need to be prepared at all times. Retrospecting on your strength and accomplishments in the context of the company mission or department goals is the first helpful step. And then practice, practice and keep practicing until you can summarize and articulate who you are, what you do well and what you can offer in a few straightforward and clear sentences. Effective self-advocacy empowers people to speak about themselves as their best spokesperson and brings them access to opportunities and resources. Among the challenges international students face in navigating the US job market, self-advocacy may be one of the biggest challenges. It is about breaking cultural barriers, doing self-exploration to know your own worth and mastering the balance between stepping in and stepping out of work circumstances, when appropriate.